Gunshot residue results from the discharge of a firearm. This includes primer, powder, and/or projectile material and products of their combustion. The residue that can be deposited on the hands of a shooter is usually the result of gases or particles escaping through openings in the weapon (such as the cylinder area of a revolver) or leaving the end of a barrel. The actual amount of residue on the hands varies with the type of weapon, ammunition, and conditions of discharge. The analysis of gunshot residue from the hands of a shooter detects primarily trace amounts of primer residue. Gunshot residue (GSR) deposits on the hands decline rapidly during the first hour after firing the weapon. In practice, GSR cannot be expected after six hours from a living subject. However in suicides, GSR can last many hours after the time of shooting. In either case, correct sample collection techniques are critical. Sampling for GSR should be performed on a live subject as soon as possible after the shooting. Ideally, samples should be taken immediately after contact with a subject in the field. A single collection kit providing for Scanning Electron Microscope (SEM) adhesive disc type sampling collection methods should be used. Caution! The subject should not be allowed to wash or rub his/her hands prior to sampling. The subject should not be fingerprinted prior to sampling. Prior to any residue collection from the hands, visually examine the subject's hands and wrists. Record the position of any visible gunshot residue deposits (black smudges) or particles with a photo or sketch. Avoid contact with the subject's hand since this may contaminate them. Also avoid cuffing the subject's hands behind his back, if possible, since this will tend to remove any GSR from the back of the hands. Caution! Do not touch the hands of the subject in the areas to be sampled for possible gunshot residues. If possible, thoroughly wash your hands and wrists before proceeding further to prevent any transfer contamination to the hands of the subject. Put on disposable plastic gloves provided before handling any sampling materials. Be sure to follow the instructions carefully. Support the hand to be sampled by holding the arm above the wrist. Have the subject relax and flex the hand during collection to allow the adhesive access over the wrinkled areas around the knuckles and palm. Do not peel off or touch the sticky surface. Do not include gloves with the samples. Instructions for Collecting, Packaging and Submission of Gunshot Residue (GSR) from Persons Suspected of Discharging a Firearm using adhesive coated discs for SEM analysis. Open the GSR kit checking that the tamper evident label was intact. Put on the disposable gloves. Select a sample disc labeled RIGHT HAND BACK. Remove the amber disc holder from the clear vial. Do not touch the disc to anything but the subject's hands. To collect gunshot residues from a person's hands, the exposed adhesive surface of the disc is pressed firmly against the back right hand in a systematic pattern until the disc loses its stickiness. Do not slide or rotate the disc on the skin. Concentrate on the back of the thumb, the web area between the junction of the thumb and the back of the index finger and down the back of the index finger extending to the finger tip. Have subject flex open creases in the knuckles to allow sampling in these areas. After the adhesive surface has been used and the hand sampling is complete, reseal the disc in the clear labeled vial provided. 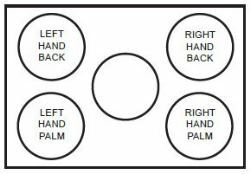 Select the sample disk labeled RIGHT HAND PALM, use the same procedure outlined above for sampling the palms except dab the palm as well as the front of the thumb, web, and index finger. Have subject flex open creases in the palm to allow sampling in these areas. Repeat this process with the LEFT HAND discs. Label the vials with all information required by your department e.g. subject's name and officer's identification. Place vials back into box. Close box and seal with evidence label. Submit it to your local crime laboratory along with the appropriate submission form and a copy of the police report if required.